Braden Hitt was born and raised in Oklahoma City where he started his culinary career. Braden started working for his mentor and friend Sandy Hamilton at Food-ez. A small restaurant and take-away prepared dinner spot. Here he learned the importance of fresh and homemade food. He realized he wanted to better his understanding of food and food technique so at the age of 27 he decided to go to the Le Cordon Bleu in Portland Oregon. While in culinary school Braden was exposed to classical French technique. After graduating with high honors, Braden started his internship at The Veritable Quandary, a well-established Portland mainstay. The restaurant’s focus was local sustainable produce and meats, which ignited Chef Braden’s passion for locally sourced and seasonal product. After completing his internship, Braden relocated to Las Vegas to experience the fast pace industry that is Vegas. His first job there was for the famous Two Hot Tamale Ladies at The Border Grill, a high volume from scratch Mexican inspired restaurant. From there Chef Braden moved to another local Vegas restaurant called Ventano’s. Here Braden learned from Chef Arnold Brione fresh classic Italian fare at the same high volume pace. Braden then moved from Vegas to Breckenridge Colorado where he had the opportunity to become Executive Chef of Sky Bleu Café, a breakfast, lunch and dinner restaurant. Here Braden was allowed to really showcase everything he had learned. He used his vast experience, doing a six to seven course, wine paired dinners in his spare time. Chef Braden began to miss the Northwest so he decided to move back to Portland and immersed himself once again into the local food scene. He landed yet another job at the Veritable Quandary where he worked for many years. After working for this fabulous restaurant for five more years, Braden received an incredible opportunity to work for The Oregon Culinary Institute. While here he taught culinary students to run a working restaurant that served the public. He found passing along his knowledge and passion extremely rewarding. 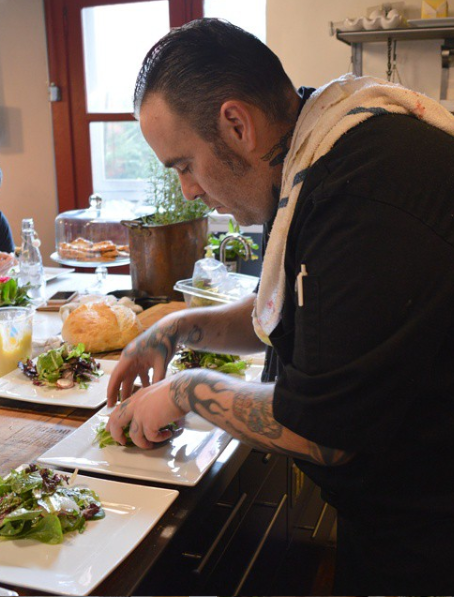 In 201 Neil Clooney (Owner and Chef of Smithfields in Ashland, Oregon) called Braden to see if he would be interested in helping start up and plan menus for his new restaurant venture. So Braden decided, once again, to move and start something new. While getting the restaurant started, Chef Braden started working for Farm to Fork on the side. A company dedicated to exposing consumers to the plentiful bounty which is Southern Oregon. Preparing four course meals, for over a hundred people, in the middle of local farmers fields. Braden became very involved and built lasting friendships with the local farmers and their families. Braden took this knowledge and became the Chef at Elements Tapas Bar and Lounge in Medford Oregon. Still using the local product Braden was really able to showcase his talents and love of the local sustainable community in Southern Oregon. Currently Braden is Owner and Chef of Over Easy in Medford. Over Easy, a pop up restaurant, currently serves brunch on Saturday and Sundays.